I'VE never been keen on carrying huge packs, even when undertaking multi-day expeditions. Fast and light has always been the key. 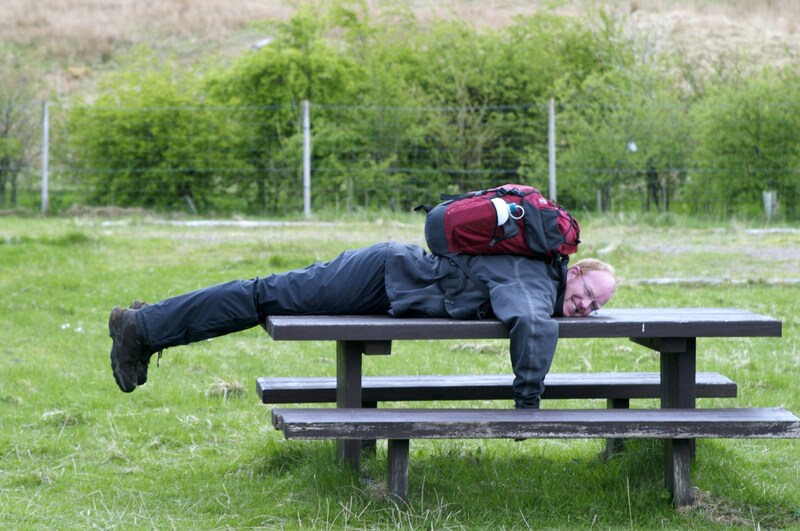 It's all about staying on the move as long as possible, with short stops for rest. That's why you will find me frantically stripping out my bag whenever I'm heading out for a few days. I don't camp, I bivvy. I don't carry lots of cooking equipment, one small pan and a spork will do. I keep it simple with food. It's a different story during the wild winter months, but for the rest of the year my rucksack will remain roughly the same weight. It's only what's inside that varies. For instance, during the recent long, hot spell, I jettisoned my waders, heavy waterproofs, gaiters, spare fleece, gloves and hat. They were surplus to needs. The ground was bone dry, and I figured that even if I fell in a stream I would be dry again in minutes. The bag didn't get any lighter. Instead I loaded up with extra fluids, even though I always carry a water filter. The result was eight long mountain days with temperatures hitting 28C without ever feeling any ill effects. Having said all that, this is a personal choice. Actually, it's probably laziness. I am prone to huge outbreaks of laziness. I just want to have an easy life. I admire those who are prepared to carry the equivalent of a small car on their backs, who have spent days planning, cooking and storing meals, who love camping and all the time consumption it involves. It just seems like too much hard work to me. That's why I like freeze-dried food packs. The simplicity - and the fact it brings back good memories of Florida in the early 1980s when we were eating astronaut ice cream powder during a visit to the Kennedy Space Centre. I remember one trip deep into Glen Affric where my friends were all carrying huge packs and I just had my normal one. A couple even had smaller packs on top of their larger ones. They were wondering what I had forgotten to pack; I was wondering just what the hell they had thought so vital that they had to bring it in bulk. The answer: They were geared for a full-on picnic, tupperware containers with home-made meals, bottles and bottles of water. And alcohol. I had sacrificed such luxury for lightweight sustenance, food that weighed nothing, and I just got drunk on the views. Their fare may have been better but the bonus for me was there was little or nothing left to carry out, so my load got lighter as we went. I suspected it wasn't much fun doing a big circuit of Munros complete with empty plastic boxes and bottles. 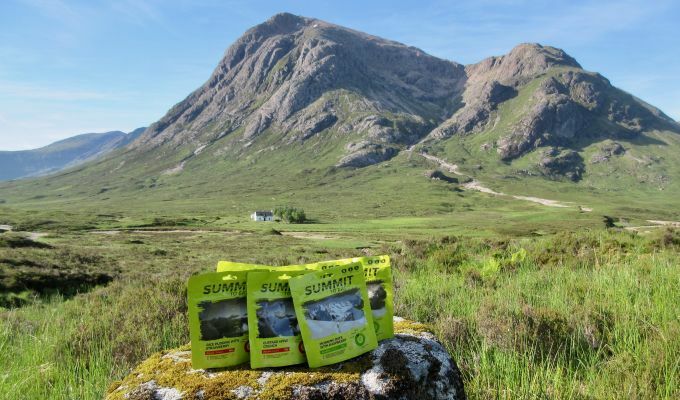 So with perfect timing, I was delighted to be offered the chance to try out some new freeze-dried food sample packs as I set off on my eight-day mountain tour. The Summit to Eat range is fairly new to the market. As with most of these types of food it all depends on making sure you get the water levels right. There are eight main meals on offer, two of them vegetarian. I enjoyed the chicken tikka with rice and the chicken fried rice and I assumed my buddy James was happy with the scrambled egg and cheese pack but I didn't like to interrupt him while he was shovelling it down like a hungry wolfhound. I'm a big breakfast person so I had opted to try the morning oats with raspberry and rice pudding with strawberry, both of which hit the spot. The custard apple crunch was also tasty but with the high levels of sats I reckon my arteries might be running up a white flag if I tucked into this too often. The packs weigh 136 grams at the top end to 80 at the bottom. Calories for the main meals are from 500-600, desserts and breakfasts 300-469, and prices range from £5.50 to £4.50. Food packs are always going to prove more expensive than preparing your own, but they are convenient and a couple of packs add next to nothing to the weight of the rucksack. 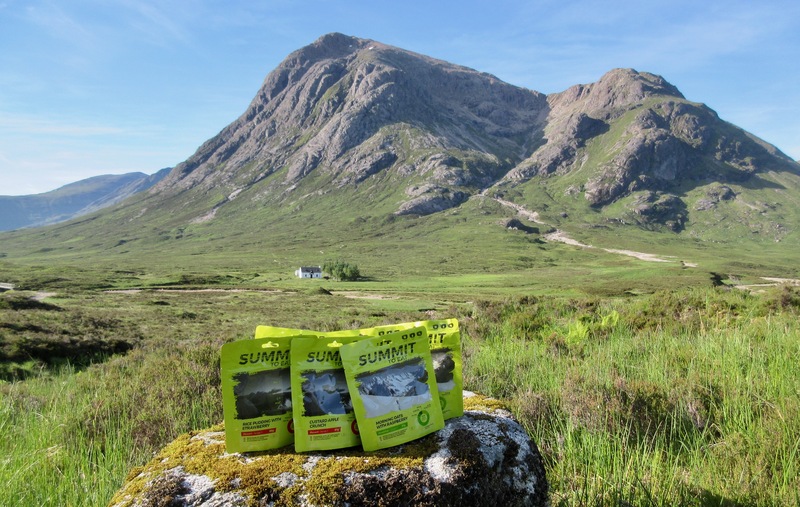 The Summit to Eat range is a tasty and welcome addition to the hillwalker's menu.